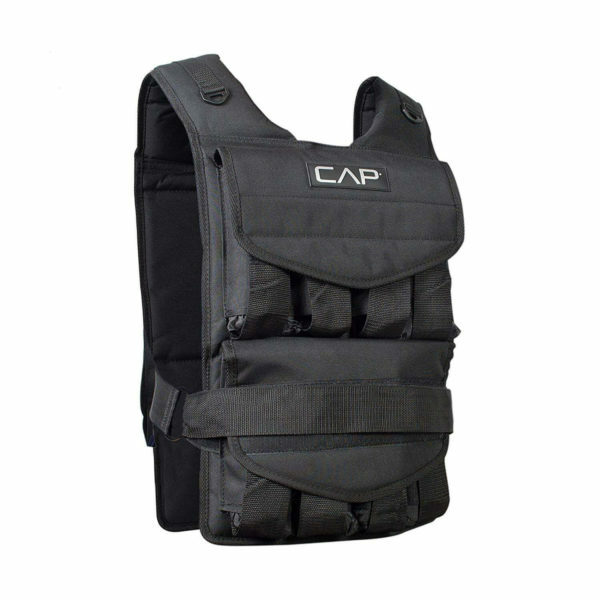 CAP Weighted Vest is one of the top quality fitness equipment as manufactured by this brand. This fantastic vest adds a new horizon to your daily exercise and workouts. The weighted exercise vest provides enough resistance to your cardio workout routines or any other sports activities. The product can be effectively utilized irrespective of gender. This Adjustable Weighted Vest is available in two different weights, for example, 20lb and 50lb. By providing high versatility, this weight vest can be used for a wide range of exercises, for example, rope climbing, jogging, sit-ups, push-ups, pull-ups, and many other forms of exercise. Whom is this product design for? Any adult including both men and women. Any housewife or working women can utilize this product effectively. This beautiful fitness equipment has a heavy-duty design which looks incredibly classy whenever you wear it. Its durable and breathable mesh easily conforms or adjusts to your body. Its neoprene padding adds an exclusive body comfort. Thus the weighted vest doesn’t feel too heavy on your body. The product is available in a short and adjustable style which is unique in its category with a weight capacity of 20 pounds and 50 pounds. Each one is pretty efficient & effective, and also serves its purpose well. This product is mainly designed for enabling an unrestricted movement during any exercise or workouts. Be it an aerobic exercise, or any kinds of outdoor or indoor sports, this short weighted vest facilitates you to add extra resistance to your workouts. The product has a potential power to improve your cardio, overall strength, muscle power, adding more rigidity to your body, quick reflex, and speed, high agility, etc. The product comes with multiple granulated sandbags or steel shot-filled weight packets. Even, you can adjust your desired weight load using these weight bars ranging from 1 to 20 lbs. The product has various stretch pockets for adding these weight bars. Moreover, the process of adding or removing weights is pretty easy, convenient, and hassle-free. You can quickly remove the weights as well. Carrying extra load during any exercise needs additional oxygen and strength, as you exercise using this vest, your muscles get adapted to the higher weight—that builds a high strength & muscular endurance. Apart from this, wearing the Adjustable Weighted Vest while running will effectively increase the load transmitted through the bones. This technique results in an increased bone mass by stimulating human cells. More precisely, bones become much stronger and denser to handle any extra weight. Even, regular exercise using this vest acts as a weight loss aid by burning the excess calorie. Also, it increases the intensity of your exercise by forcing the body to work harder. The vest is manufactured in such a way so that one size adequately fits all design. It has pockets to carry your iPod, cell phone, an mp3 player so that you can enjoy music while practicing workouts. Its quick release buckles and reflective strips add more safety features. Effective For any aerobic exercise and sports activity. Efficient for both men and women. Extremely comfortable to wear, easy to use, and easy to remove. Breathable material adds more comfortability. The ergonomic design provides excellent durability. Question Do the weight bars also come with this vest? Answer: Yes, you will get multiple weight blocks that fit perfectly in the corresponding pockets of the vest itself. Question: For whom the product is suitable? Answer: It is appropriate for any adults – both men and women. Question: What is the weight capacity available? Answer: The product comes with two weight capacity i.e. 20 pounds and 50 pounds. Question: How to assemble the prior The vest doesn’t require any assembly. Answer: Just add the weight blocks to obtain the necessary load and remove it whenever you need. If you are looking for a short and easily adjustable weight belt, then this product, CAP Barbell Adjustable Weighted Vest will be ideal and apt for you. It will give an extra edge your workouts. The product is adjustable, comfortable to wear, easy to use, and much durable. It also has additional safety precaution to provide a better support during your workouts. The product is one of the best in its category and considered as of the top-rated and best selling weighted vest. Price wise, it is dirt cheap and affordable. Overall, this product offers a great bargain on its design, looks, quality, and performance.